The Spectrum 25 Call for Entries opens on October 16, 2017. This is an invitation to all professional and student artists, art directors, publishers and artist representatives to submit entries to the 25th Annual Spectrum International Competition for Fantastic Art. All art works in all mediums embracing the themes of science fiction, fantasy, horror, and the surreal are eligible for this show. Fantastic Art can be subtle or obvious, traditional or off-the-wall, painted, sculpted, done digitally or photographed: there is no unacceptable way to create art and there are no set rules that say one piece qualifies while another does not. Imagination and skill are what matters. Work chosen by the jury will be printed in full color in the Spectrum annual, the peer-selected "best of the year" collection for the fantastic arts. Any published or unpublished art may be submitted in the appropriate category. Work must have been finished or first published in 2017. Do not submit original art for judging: Entry material submitted to the jury will not be returned. The jury will select works from the entries for inclusion in the Spectrum annual; the act of entering art in the competition does not guarantee inclusion in the book. If your entry is accepted, be certain that a reproduction-quality digital file (400dpi, tiff file at 9" wide or 12" tall) is available to insure the entry’s inclusion in the Spectrum annual. Failure to provide reproduction-quality material by the deadline given in an acceptance letter will cause an otherwise accepted entry to be excluded from the book. One "A" Form and the entry fees must accompany your total package of entries. (One "B" Form must be taped to the back of each entry, but only one "A" Form needs to accompany each participant's entries.) The single entry fee is $20.00 per work. The series (five or fewer related pieces) entry fee is $40.00. Note that the Series entry fee is a price break for related works only (i.e. multiple illustrations for a book, pieces in an advertising campaign, pages from a comic story, works for a themed gallery show, etc.). The jury may select any art it deems worthy and is not obligated to select all works from a series entry. All checks must be made payable to Flesk Publications. Entry fees for both domestic and overseas entrants may be paid with a Visa, American Express, Mastercard or bank debit cards by providing the appropriate information (card number, expiration date, signature, etc.) in the designated spot on the entry form. The billing address of the cardholder must be provided on the form. We do not accept bank transfers of foreign checks. Entries must be postmarked and prepaid, with all appropriate forms and entry fees, and sent to Flesk Publications/Spectrum Fantastic Art, 2871 Mission Street, Santa Cruz, CA 95060, U.S.A., no later than January 25, 2018. (For Express Mail, UPS, Federal Express, etc., please check the "No Signature Required" option) The judging will take place shortly after the deadline. Phone 408-206-2346 or email info@spectrumfantasticart.com with questions. Only entrants whose works are selected by the jury for inclusion will be notified in April 2018 by email, with additional information regarding what we'll need for the book. A list of accepted entrants will also be posted on the Spectrum website, www.spectrumfantasticart.com. Please check to see if your name is on the list before contacting us to ask if you made it. We will not be notifying entrants that did not have work selected: Only artists with work selected by the jury for inclusion in the annual will have their names listed on the website and will be notified by email. Entries will be divided into eight major categories. Members of the jury will judge each category objectively, keeping in mind the work's intent and purpose in their decisions. Black-and-white, limited color and full-color works will be considered equitably. Each entrant is responsible for placing his or her work in the appropriate category by writing one of the following codes in the designated box on Form "B." Each entry form must be filled out completely. One "A" Form per entrant and a "B" Form for each piece of art must accompany your entries. 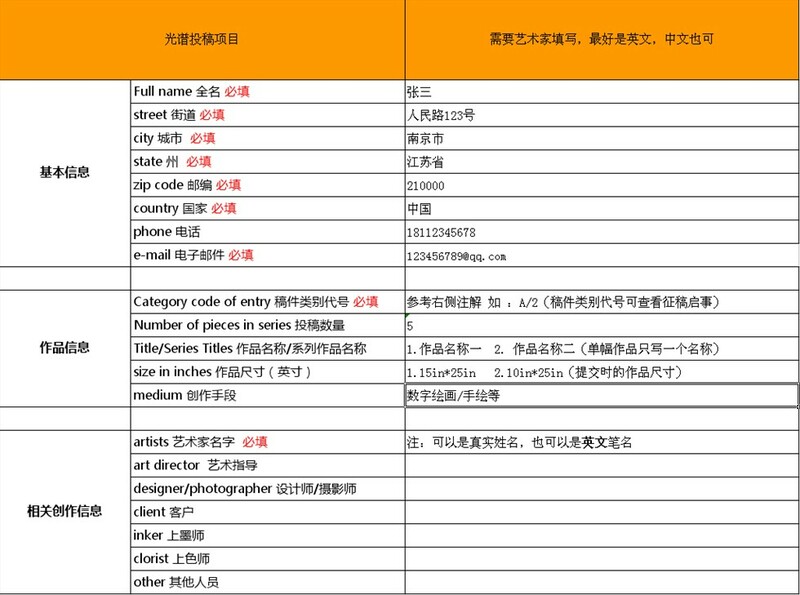 Each form must be filled out completely and legibly. Please ask if you are not sure of the proper category for your entry. For single entries use code A/1. For series entries use code A/2. Suggested entries include art for newspapers or magazines; posters for films, TV or publications; packaging for video or music products; and art for brochures, billboards or POP displays. For single entries use code B/1. For series entries use code B/2. For single entries use code C/1. For series entries use code C/2. Suggested entries include covers or individual pages from adult or children’s comics or graphic novels. No complete comics will be judged as a single entry. Do not submit work featuring license-protected comic characters without the permission of said character’s copyright holder. For single entries use code CA/1. For series entries use code CA/2. Suggested entries include work created for films, TV programs, theater or video games. Do not submit work that is license-protected without the permission of the proper copyright holder. Artwork submissions are allowed for two years after the official release date of the product they were created for, to allow time for the permissions process. For single entries use code D/1. For series entries use code D/2. Suggested entries include sculptures created for model kits, collectibles, editorial or fine art. A maximum of three photos of a single entry (to show detail) may be sent for no additional fee. For single entries use code E/1. For series entries use code E/2. Suggested entries include all art appearing in magazines or newspaper, including spot art, political or humorous works, or on television news or “magazine” programs . For single entries use code I/1. For series entries use code I/2. Suggested entries include art appearing in connection with announcements, annual reports, calendars, greeting cards, prints, portfolios, posters, plates, website graphics, collectibles, promotional directories or self-promotion mailers, and any other venues not obviously covered by the other categories. For single entries use code U/1. For series entries use code U/2. Suggested entries include art created for portfolios, student work, gallery shows, experimental studies, speculative assignments and ongoing projects for work to be published at a future date. Give your work a fair chance at being selected for inclusion in the book. Try to submit the best quality representation of your art possible. No, don’t spend an arm and a leg on color-corrected prints, but DO make sure the submission is in focus, isn’t the size of a postage stamp, and doesn’t look like it was photographed in the fog. Print Submissions: Submit proofs, tear sheets, color photographic prints, clear photocopies, laser prints, or other reasonably high-resolution, computer-generated print. Recommended sizes are no smaller than 8.5" x 11" and no larger than 12" x 18" although all sizes are accepted. No original art, slides or transparencies will be accepted for judging. Do not submit complete books, comics, graphic novels or articles as a single entry. One Form "A" should accompany your entries. A Form "B" (or a facsimile) must be taped to the back of each entry. If the entry is part of a series, a Form "B" must be taped to the back of each piece. Credits for the Spectrum annual will be taken from Forms "A" and "B". Spelling, credits and addresses must be complete and legible. Digital Submissions: Visit the Spectrum online page to enter your submissions online to enter your submission online and for digital file specifications. Each accepted entry will be reproduced in full color and given complete credit in the twenty-fifth Spectrum annual; the contact information for the artist or their agent/representative will be printed in the artist index. The person who has submitted an accepted entry will receive a complimentary copy of the annual. International residents are required to pay shipping. Tear sheets are not available. Additional copies may be purchased at a discount.